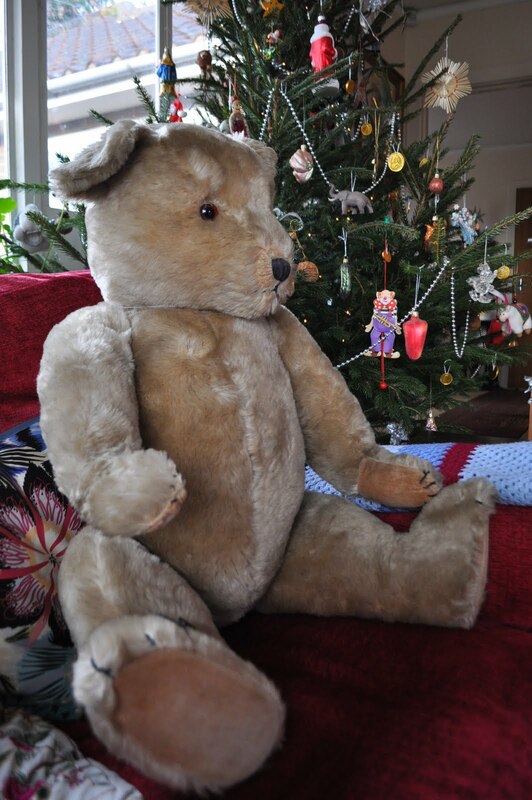 Here we have the most stunning Steiff Teddy Bear who dates from around 1907 and is a huge 28in. (71cm.) high. He has the most beautiful face. 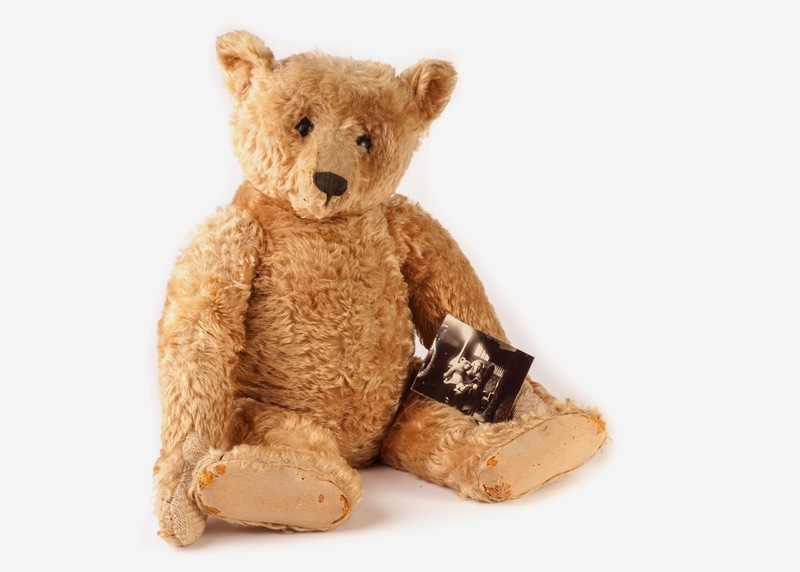 This beauty is actually called 'Teddy Bear', which is fairly unusual for the year 1907. Look at his wonderful hump and long, long arms! He is in good condition for his age, a very good coat of fur. He is a bit thin on the top of his head and his left ankle and wrist have a repairable split. 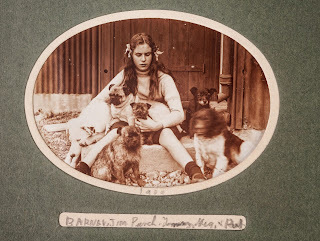 Seated here with her family of doggies. 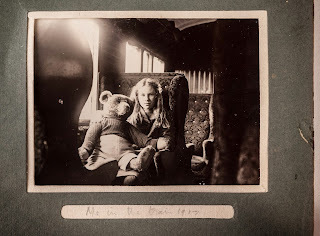 But this is the best photograph (an is actually sold with this original photograph), this old photograph shows her proudly clutching her new bear on a train journey back home in 1907 on the newly-opened West Highland line from Glasgow to Mallaig. This second photograph showing Vera and Teddy including some of her family and their dogs, the original of this is also included in the auction lot. Vera Caldwell spent most of its life near Morar in the West Highlands of Scotland. Vera was born in 1897. She was the daughter of a famous zoologist, who had met her mother in Australia while researching into the duck-billed platypus (he established for the first time that they laid eggs). 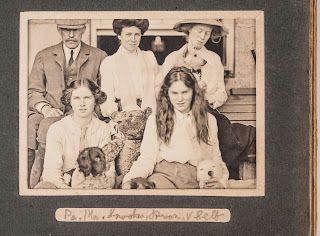 When she was very young, the family moved to Morar, where Vera had an idyllic childhood, even being taught by her older sisters rather than receiving a formal school education. 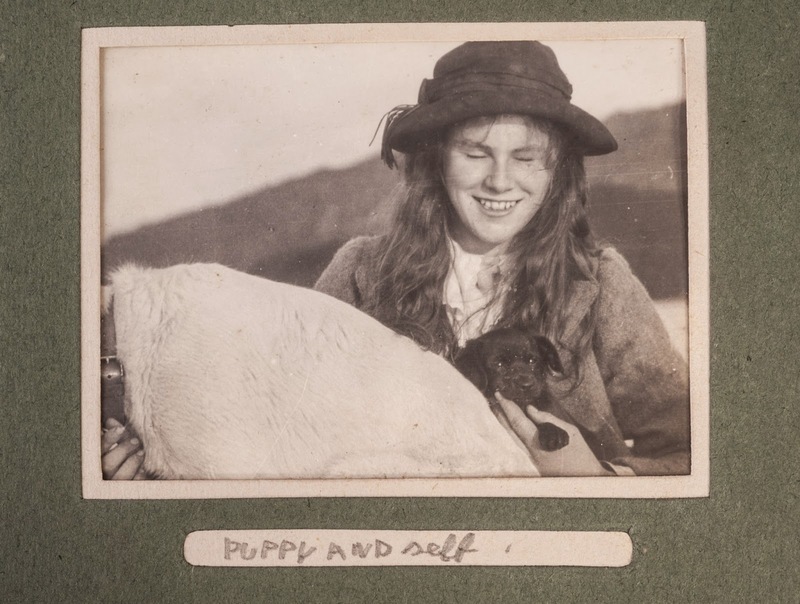 After she married in 1916, she lived near Glasgow for some time but spent most summers at Morar, and she returned to live there in 1947 until her death in 1993. 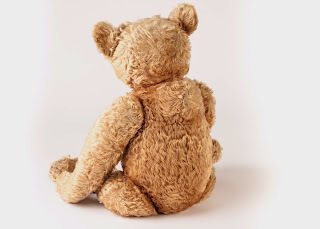 The bear always remained a great feature of life in the nursery at her house, and it received enormous attention and special love from her own three children and then from her seven grandchildren, and indeed from her great-grandchildren. Teddy Bear and the two original photographs is the star Teddy Bear lot in my auction on the 12th June 2015, his estimate is £3000-4000, for all this history I think is a bit of a bargain. For more information please email me daniel.agnew@hotmail.co.uk or find me on Facebook, search for Daniel Agnew, send a friend request and follow all the latest news. 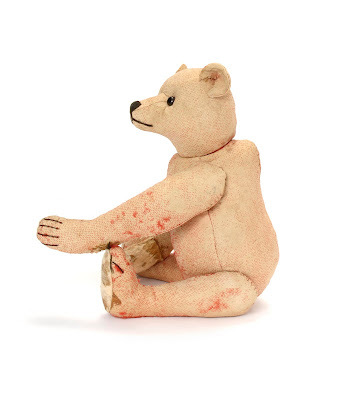 I've just sold this rare bear cub, from one collector to another. I've seen him once before in poor condition, but this one is in excellent condition. He was made in 1926 by H.G. Stone for their Chiltern Range. This example is 15 inches high, but seems much bigger as he is such a chubby chap! His head swivels and the arms are jointed. The plush is a beige wool and has amber and black glass eyes. His hand pads are cotton cloth, his feet are card lined felt. He is designed so he stands, but the card in his feet has warped with age. He has a lovely smiley open mouth, which is red felt and also has a red felt tongue. For some reason he has been designed with a very large bottom and thigh area, which is finished off with a stump of a tail. 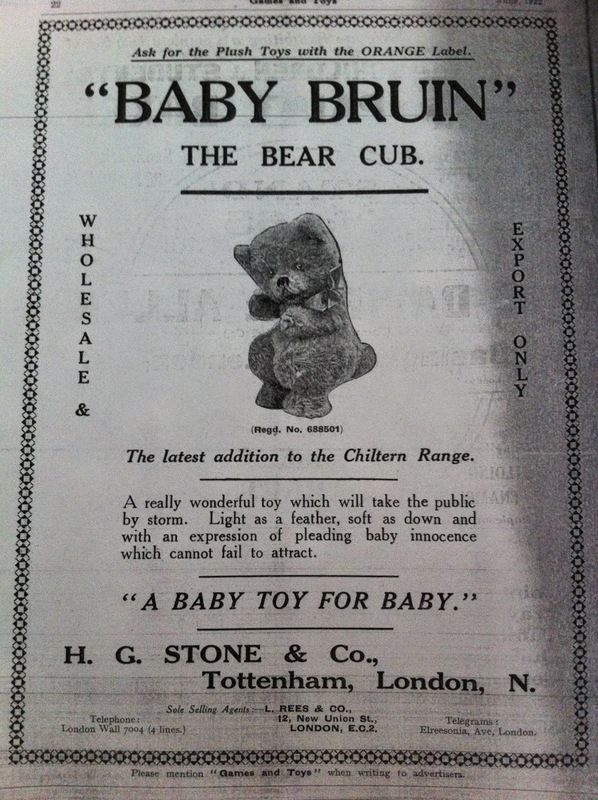 I have found this original advertisement for him in my research for my long awaited and hardly started book on British Teddy Bears. It is so nice to identify an unknown bear, when you find an advert like this. I always estimate at least 50% of bears as being unidentified, so to tick one more off is great. Have you seen one before? Perhaps you have one with a label? This is early on in Chiltern's production, so the label would probably have been a card disc. More exciting finds to follow..
His backing cloth is a cream or perhaps original white and the bright red mohair (nap) is woven through the cloth. Where he is bald he has dotted remains of red mohair, but in some places it is still bright and fluffy. It is a bit of a mystery why he is so bald, because he is still strong and apart from the lack of fur and few other problems, is in good condition. 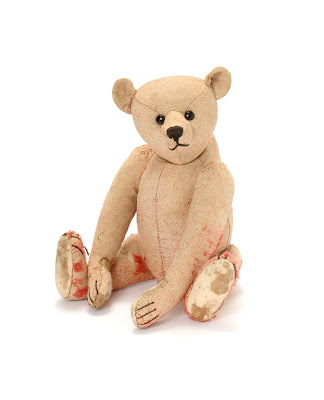 His black stitched nose and mouth are almost pristine, as are his eyes; these are completely original. 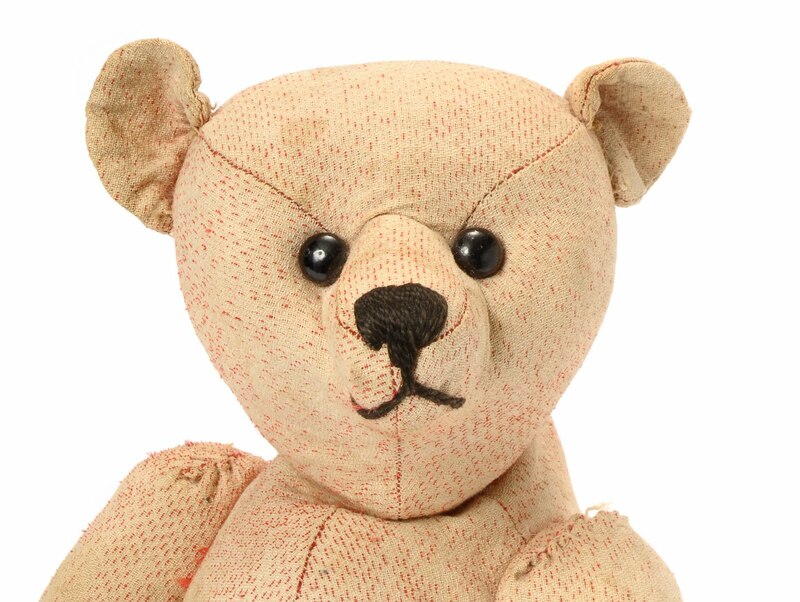 The nose stitching is vertical; whereas on a smaller bear it is normally horizontal. At sixteen inches (40.5 centimeters) high, this makes him the taller brother of Alfonzo, who is thirteen inches high. 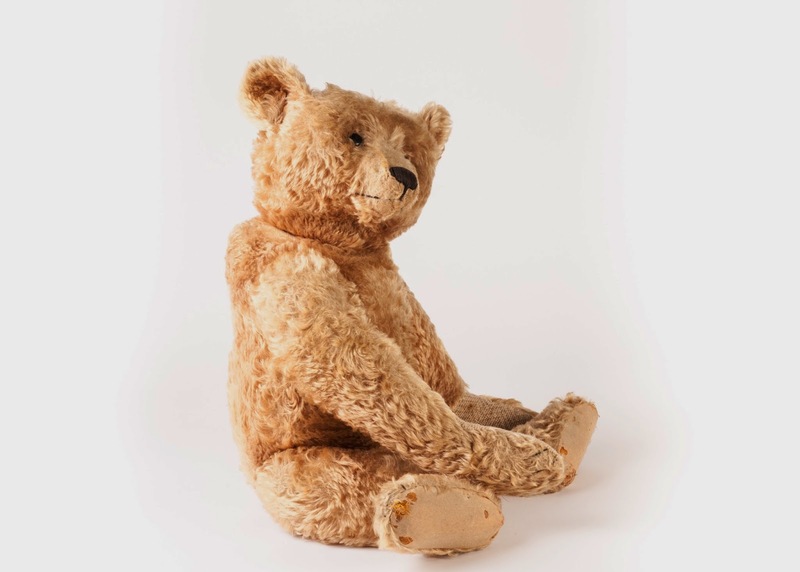 It has been suggested by Steiff that Alfonzo, Elliot (the blue Steiff sold by Christie’s in 1993) and presumably this bear, were part of a sample of twenty-four sent to Harrods in London in 1908. 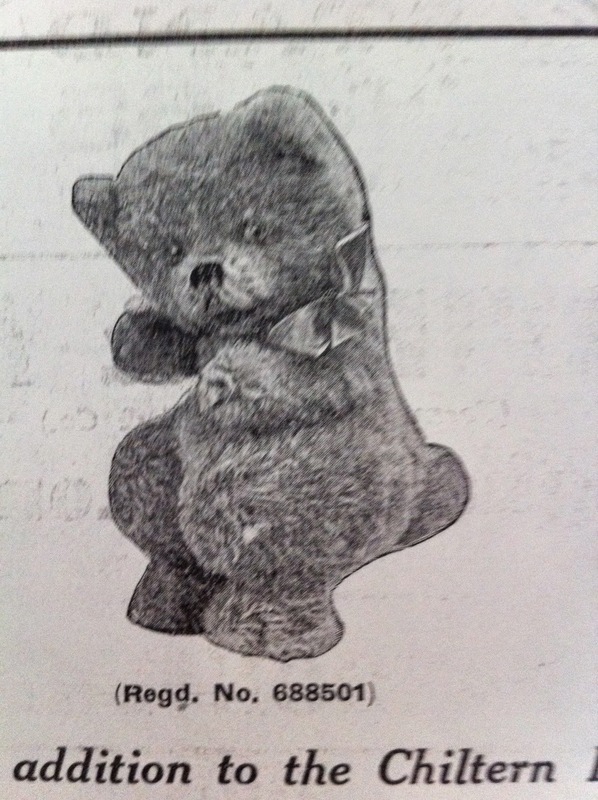 So here we are, one of the missing twenty-two and only the second red Steiff to have ever been found. This makes three surviving examples from the original group. Alfonzo, the only other known red Steiff, who everyone knows; was sold by Christie’s in 1989 for £12,100. 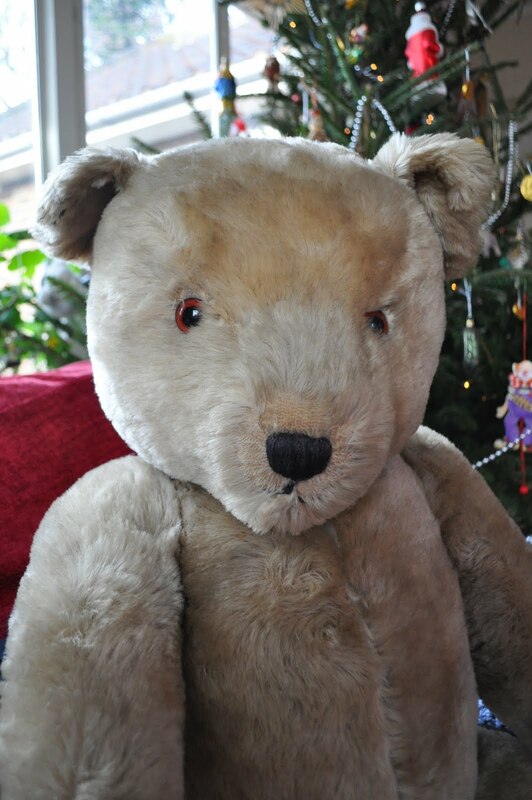 He is perhaps the most famous antique Teddy Bear in the world and resides at Teddy Bears of Witney owned by Ian Pout. Elliot, a blue Steiff sold for £49,500 (again by Christie’s in 1993) went to the Ydessa Hendeles Art Foundation, and now lives in Canada amongst one of the finest bear collections in the world. Where Alfonzo has the most amazing provenance, this red chap is a little more of a mystery. He was given to the owner when she was a little girl of 4 in 1978. There is a hint of a romantic past; her aunt’s friend was called Delphene, who is believed to have had Romany Gypsy roots. She lived in a static caravan behind the current owner’s grandmother’s pub. After a number of visits, the current owner plucked up courage and asked if she could keep him. After a slight hesitance Delphene said yes and he soon became a favourite toy. She took him everywhere and slept with him. 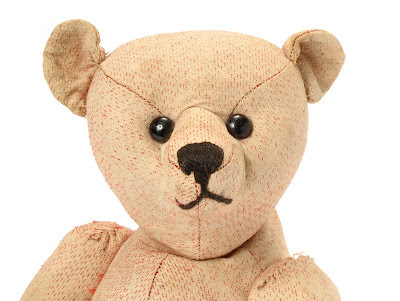 “He was definitely the first toy I really loved and who seemed so important to me, like he was a little person and my friend.” I think this sums up the appeal of Steiff bear’s faces; they really draw you to the bear. 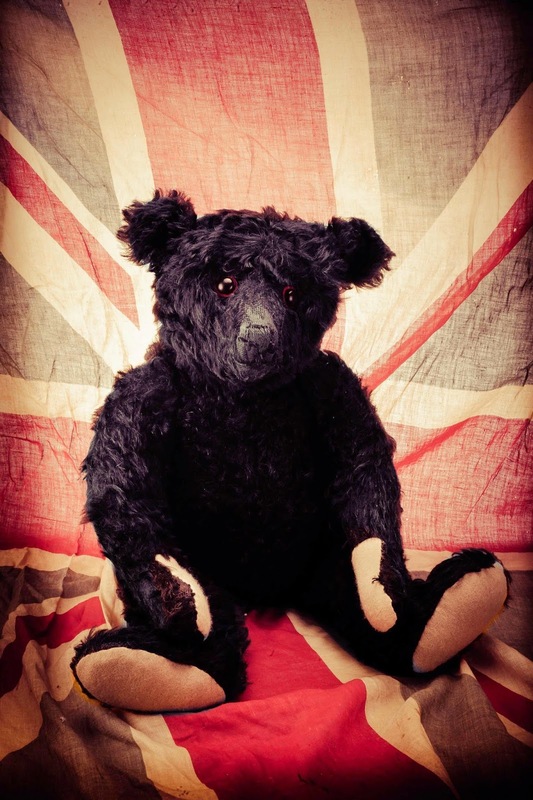 This bear is now coming up for auction, I am organising this at Lord's Cricket Grounds on the 29th May 2011. 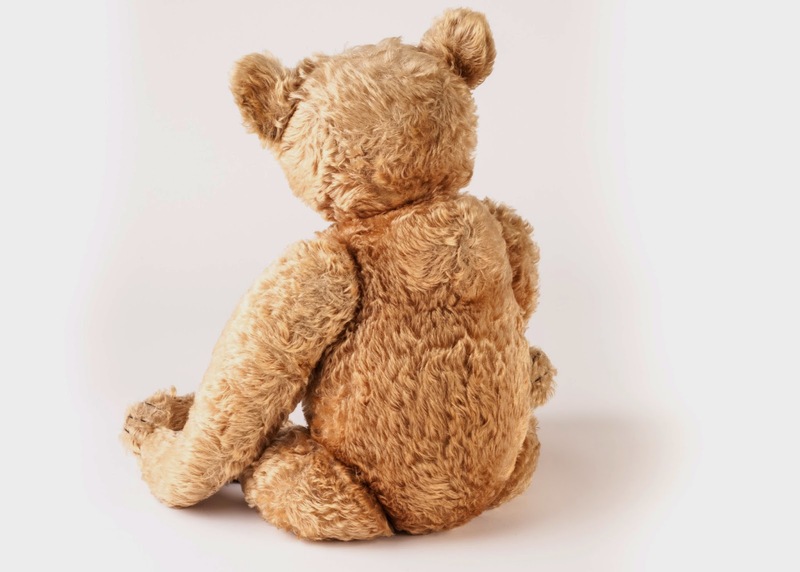 It will include all sorts of Teddy Bears and soft toys, as well as dolls and traditional toys. Please visit www.danielagnew.com for more details. Or if you would like to follow me on Facebook, search for Daniel Agnew and send a friend request. If you have anything to consign, you have up until the first week of April. Latest find - a rare Gibbs Toy Performing Jumbo. This is a wonderful toy, probably from 1910-20s. American company. 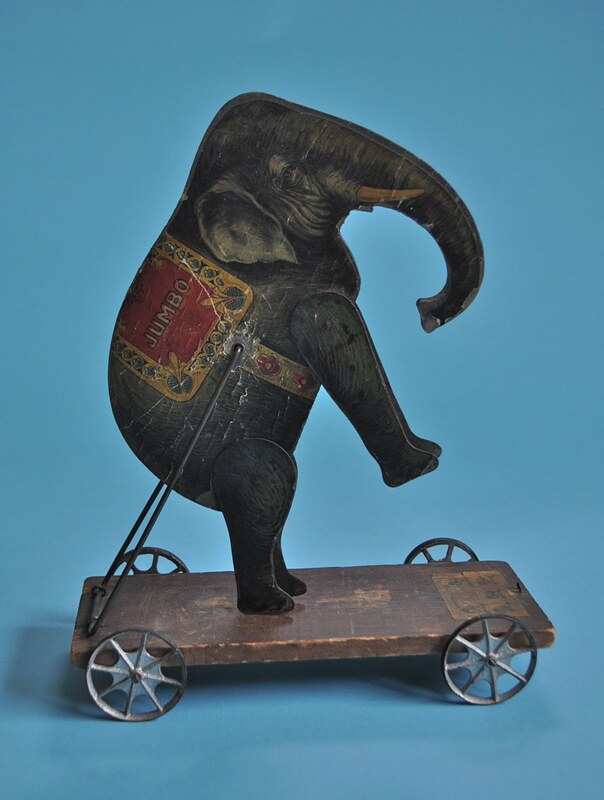 A wooden platform with cast metal wheels, the jointed elephant is wood with metal legs covered in printed paper. He has a label on the surface of the platform which shows the many positions he can be balanced in. He is 10 inches, 25.5 centimetres long. Here I am trying not to blog about Steiff for a while and then I get sent this lovely picture. 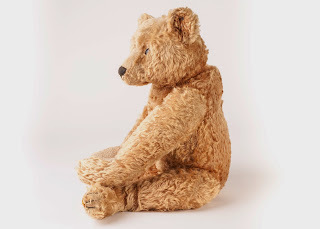 Steiff dolls are amongst my favourite things, this one I believe is called Schiduen or Skiduen 40, he appears on page 429 of the early grey Steiff Sortiment. Although the one I want most is the fat skier! So I thought I must share him with you. 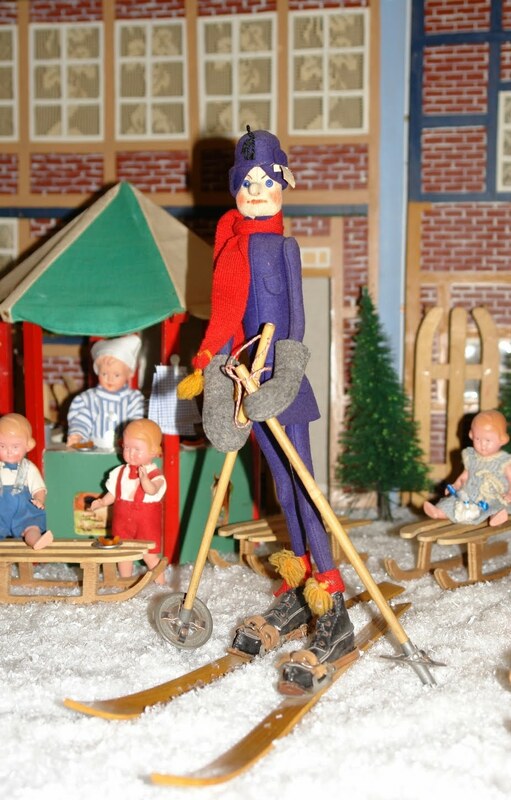 He comes from the Norddeutsches Spielzeugmuseum (North German Toy Museum) in Soltau. 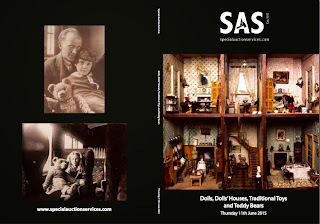 There is a link to this museum on the right top of this blog. 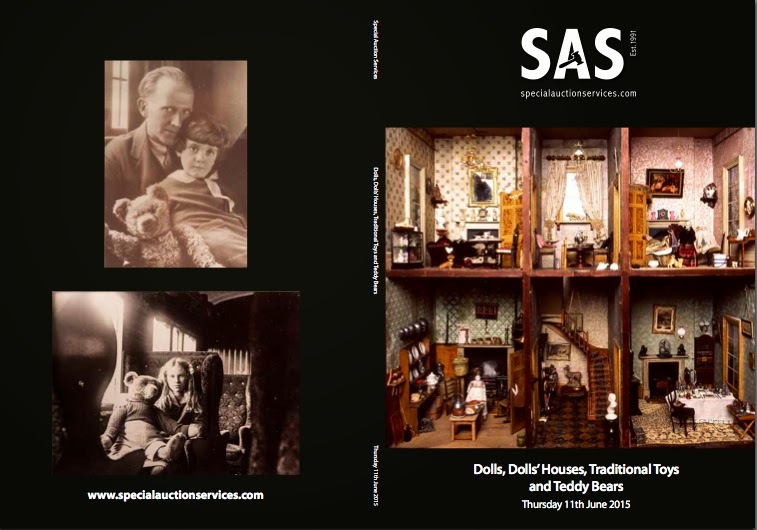 One of the best toy museums I know and they have some very special Steiff dolls. Well worth a visit if you are ever that way. 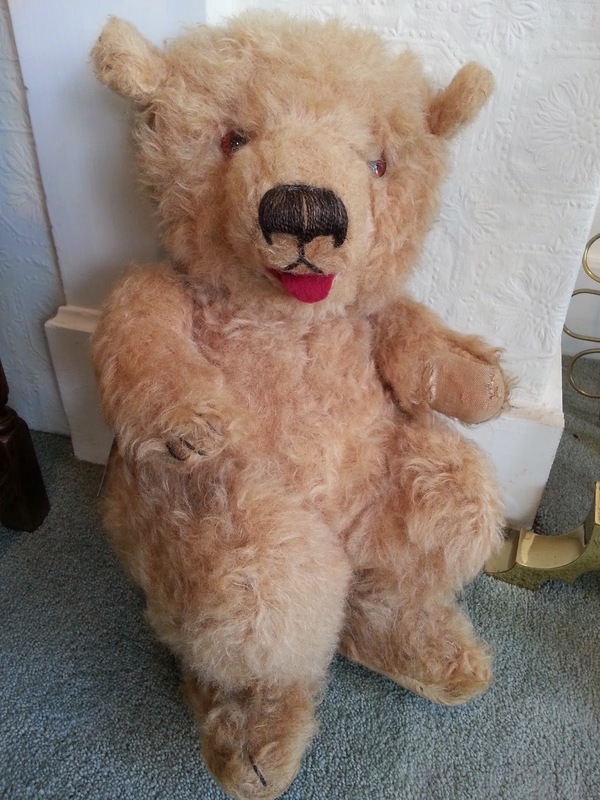 Look at this wonderful chap, he dates from the 1950s and is the biggest size Hugmee you can buy. He is 36in. high. Here he is taking up half the sofa in front of the Christmas tree, what a great addition to any collection.